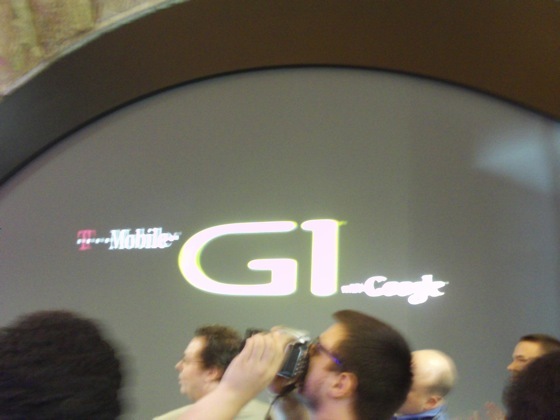 T-Mobile Android G1 Launch Liveblog: It's Got A Compass! 10:06 AM We’re here and we’re ready to rock. 10:08 AM Doug is uploading official press images. That was pretty fast. 10:12 AM Sorry. The time is set an hour ahead. It’s 10:12am in NYC right now. 10:14 AM 15 minutes to go. 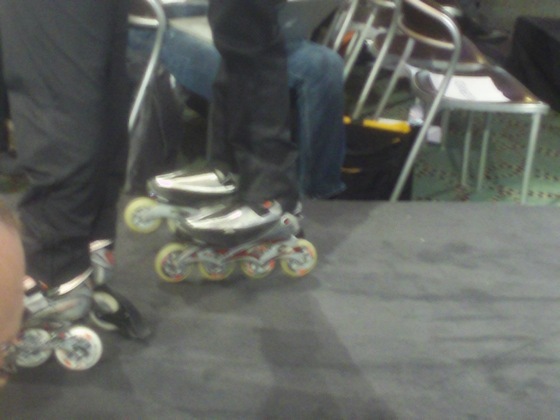 10:22 AM Hello Techcrunch readers. 10:31 AM Cole Brodman – we can’t be face to face anymore. 10:31 AM Technology has bridged that gap. 10:31 AM New mobile Internet of the future. 10:32 AM Peter Chou, CEO HTC is here. 10:34 AM Superior user experience. Pioneering approach to open up the wireless Internet. 10:35 AM Founding member of the open handset alliance. 10:35 AM Erick will be joining me. 10:36 AM Not much exciting to photograph right now. 10:36 AM Schlaffer talking about how DT has already grown SMS and Web traffic even without a real mobile Web phone. 10:36 AM Andy Rubin comes up. Google was founded on the Internet. 10:38 AM Expects there’s a big celebration in Mountain View right now. 10:38 AM Rubin: With Android we are bringing some of those [Internet] strategies to the mobile phone. Developer will be able to develop on it and also to modify it. Because it is open,it is somewhat future proof. 10:39 AM announcement.t-mobileg1.com – remember you can watch the whole show at tmo. 10:40 AM Android is nimble, flexible, and powerful. 10:42 AM open systems and open standards – embracing third parties. 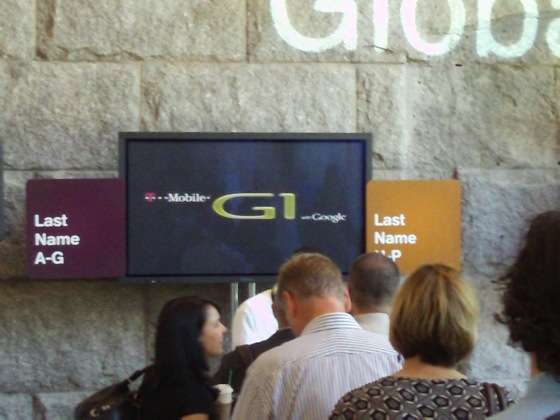 10:42 AM Open handset alliance – devices, apps, and new services allow folks to embrace the mobile Internet. 10:44 AM Finally running the video showing off the G1. Lots of fingers flying everywhere. Love the Sidekick-like keyboard. 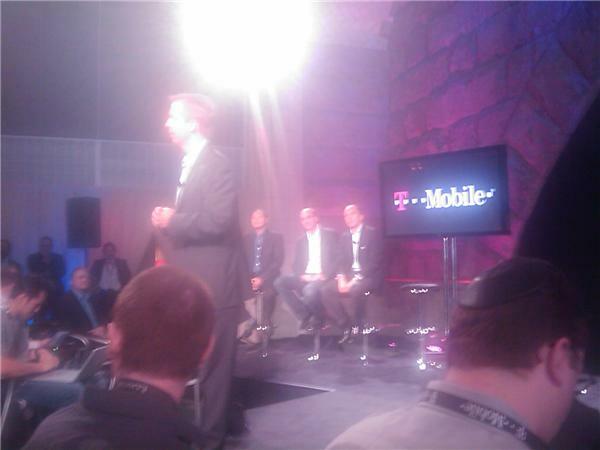 10:46 AM Cole Brodman, T-Mobile CTO: “Let’s not tease you any longer. Let’s take a detailed view of whatthis device can do” Rolls another video. 10:46 AM That keyboard is the one thing so far that sets it apart from the iPhone, methinks. 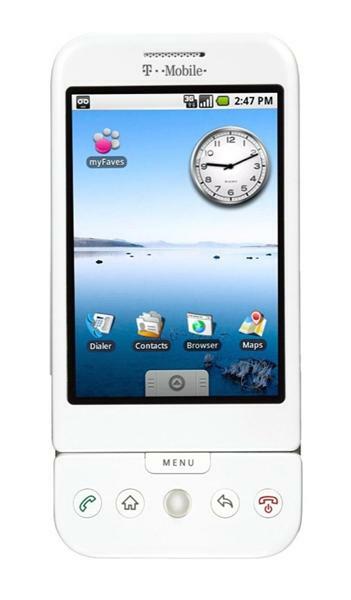 10:46 AM Video: great touch screen, you can swipe, can frame and rop a photo to homescreen (just like the iPhone!). Drag and drop, baby. 10:48 AM Street view and google maps look great. 10:48 AM Compass mode – scene moves as you move around. 10:48 AM Slide out keyboard. 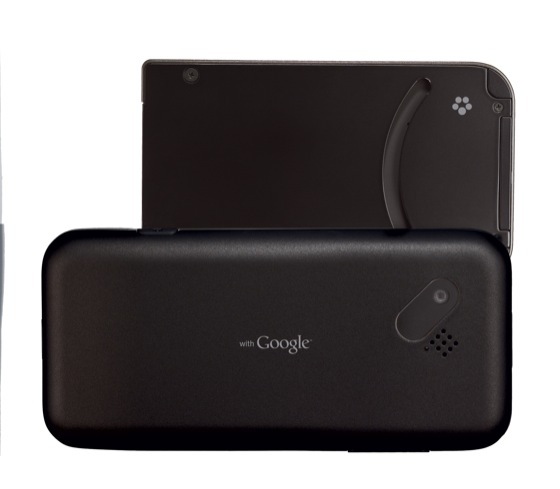 Google Talk, Google Maps with directions and traffic view, street view with landmarks (again, just like the Phone). But this is cool: compass mode in Street view, the scene moves as you do. 10:49 AM Facebook looks good in the browser. That’s Webkit for ya. 10:49 AM Music player. With one “long press you can go deeper into what you are really interested in.” I like the sound of that. 10:50 AM UI is pretty darn nice. 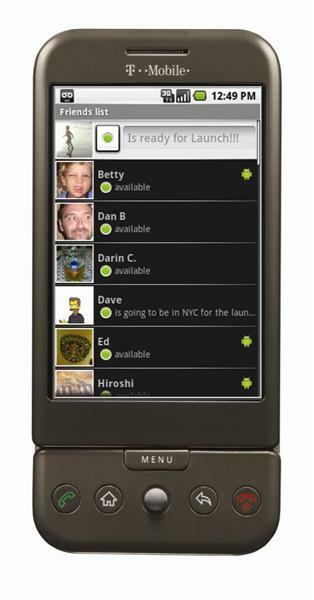 It’s what Symbian should be at this point in the game. 10:50 AM Dedicated search button on keyboard. Ooh, yeah, that’s like the equivalent of bundling MSFT IE or Office on the desktop. Watch out, Redmond. 10:55 AM Cole: introduces third party parners. Eco Real (?) let’s you track your carbon footprint. 10:55 AM Eco Rio, I think. 10:56 AM Cole: Next is shopsavvy, barcode scanner, gives you comparative pricing on goods. (Yeah, we wrote about them). 10:57 AM Cole: pricing will be $179. 10:58 AM Existing T-Mobile customers can order them online. Commercial launch date is October 22. $25 data plan with unlimited Web, limited messaging. $35 unlimited. So no free email. Guess Fortune was wrong about dat one. 10:58 AM Launching 3G network nationwide. 10:59 AM in UK early November, rest of Europe 2009. 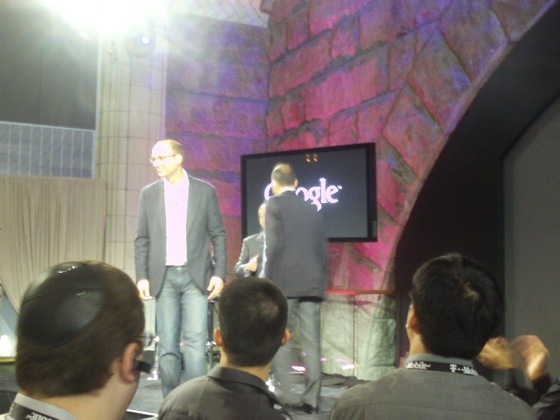 10:59 AM Andy Rubin: We will go broader with more features and functionality. 11:00 PM Q: Will this function as a tethered modem, and can you just get the voiceplan? 11:01 PM Q: Can it read Word docs? Exchange compatibility? Is the device simlocked to T-Mobile? 11:01 PM A: can’t use it as tethered modem, need to buy data plan. 11:02 PM Rubin: Can read Word docs, Excel, no Exchange, but opportunity for third party developer. 11:02 PM Email will be push. 11:02 PM Cole: It will be SIMlocked. 11:02 PM Is there a desktop syncing app? 11:02 PM Cole: Not a desktop application. 11:03 PM Cole: Best experience will where we have 3G. Will also have WiFi. 11:03 PM Q: SIM lock question. How locked is it going to be? 11:04 PM Cole: No guarantees in technology. But we’ve locked it. 11:04 PM Q: What kind of marketing push and will Google participate? 11:05 PM video is coming. it’s not ready to roll yet. 11:06 PM Q: Will it use teh Chrome browser? 11:06 PM We’ll put the video back up as a standalone video. 11:06 PM Rubin: It is Chrome-like. 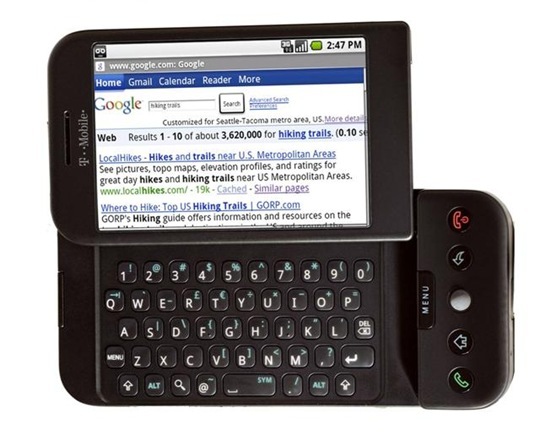 Based on teh same underlying technology [Webkit], but Chrome is for the desktop, our browser if for the mobile device. 11:08 PM Q: What are the future plans for Gmail. 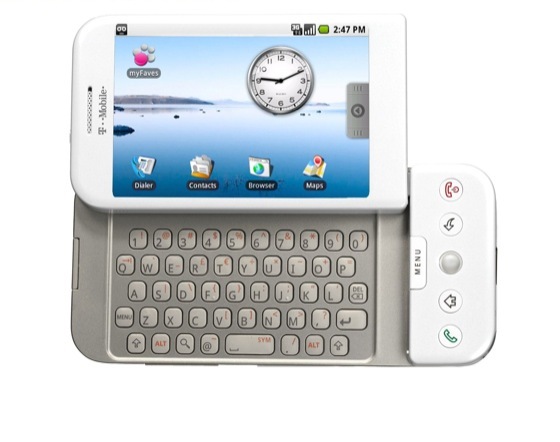 Anything out of the box that the G1 will do differently than with the iPhone. 11:08 PM Q; Does it work with iTunes and Skype? 11:09 PM Larry Page and Sergey Brin surprise visit! 11:12 PM Brin: i get that same kind fo pleasure playing with tehG1. I have been using it in my pocket for a while now. The first app I wrote was one where you throw the phone up in the air and it calculates how much time it takes to hit the ground, using the accelerometer. 11:12 PM Page: I suggested we not ship that app. 11:13 PM Page: There are 3 billion mobile phones. This is as good a computer you had a few years ago. When you think of that in terms of access to the Web, that is a tremendous opportunity. 11:13 PM Page: the speed differnce between using a phone and a laptop is still pretty big. being able to do search with the fidelity you used to have on your laptop is a big deal. 11:19 PM Cole: Supports AAC, WMA, MP3, but the content would have to be DRM-unlocked. [So they support, openness, and DRM free in music, but when it comes to the SIM not so open].